Normally you wouldn’t think the IRS would have anything to do with your passport, since your passport is issued by the State Department. 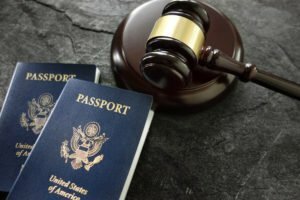 So what is the connection between IRS and your passport? On December 4, 2015, former President Obama signed legislation into law giving IRS more leverage in the collection of seriously delinquent taxes. This new law went into effect on January 1, 2016, putting thousands of U.S. taxpayers in jeopardy. The IRS spent the next 20 months creating its process so it could fairly administer this program. Finally, the guidelines were published on the IRS website on September 6, 2017. A taxpayer who ultimately gets on the “Certification List” sent to the State Department for passport action should not be surprised at being on the list. The individual has received at least three notifications of the possibility of getting on that list. These notices are sent to your last address of record with the IRS. So, it is important to keep the IRS informed of your current address via the IRS’s change of address form (Form 8822). This is key to avoid being “surprised” and untimely inconvenienced. Notifying the IRS directly of any address change is critical. The first notice is an additional statement that has been added to balance due notices from the IRS. In the section of the notice “What you need to know,” new information about “Denial or revocation of United States passport” is now included. This information constitutes written notification to the taxpayer. The next indicator the individual will get that now makes him eligible for “the list” is an actual levy on wages or bank accounts. The actual levy will be preceded by a “Final Notice of Intent to Levy.” This notice will inform the individual of his/her rights to appeal the planned levy (seizure) actions. Finally, the individual will get an official notice from the IRS that the person actually is on the list of seriously delinquent taxpayers whose name is being sent to the US State Department. This notice will be sent to the individual by REGULAR mail to the individual’s last known address. Again, if you do not keep the IRS informed of your address, you may not receive this notice. If you or someone you know has an outstanding tax balance greater than $50,000, has a Notice of Federal Tax Lien on their record, and has been hit with an IRS levy, the individual should promptly seek help from a tax professional to start toward a resolution. What if I travel for business? If you need your passport to keep your job, you must fully pay the tax balance or make an alternative payment arrangement to avoid certification or to have your certification reversed. What happens if I’m overseas and need to get home? If you are overseas and your passport is revoked, the State Department may issue a limited passport good only for direct return to the United States. How will I know if my passport application has been denied or if my passport is revoked? The State Department will notify you in writing. How can I avoid having my passport revoked or denied? The IRS expects you to pay the full tax amount due. If you can’t do this, in order to avoid certification or to have IRS reverse your certification, you will need to make alternate payment arrangements with them, such as an offer in compromise or an installment agreement. If you already have a payment arrangement, IRS will expect you to timely keep up with that arrangement. Once I take care of my tax debt, how long will it take to get the State Department to release my passport for travel? When your tax problem has been resolved with the IRS, the IRS will withdraw the certification within 30 days and will send the State Department notification as soon as practicable. Fortunately, before the State Department denies a passport, the State Department will hold a person’s application for 90 days to allow time to pay the tax debt in-full or to make satisfactory payment arrangements with the IRS. If you travel outside the United States, now is the time to address the tax debt with the IRS. If you know someone who travels, alert them to this potential issue as well. Need help? Call your tax resolution attorneys at the Sodowsky Law Firm, Elden Sodowsky and Sammy Kim, now at 703.991.6393.